OMG I was JUST at my store and didn’t see these speed shorts in Dazzling but they just sent out a product alert email with this picture. I am in LOVE with this color. I am not at all an orange person but this is so gorgeous and vibrant and a true orange. I must have a cool racerback in this color. "Fit Review: Practice Freely Tank Lavender Dusk and Flow and Go Tank in Deep Navy"
"New! 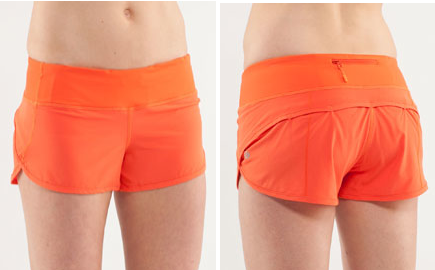 Tracker Shorts in Ultraviolet"